Fathers Day always brings a lot of questions of what to buy dad. Long gone are the days of buying a tie, and flowers for dad might be appreciated but don’t really feel like a dad gift somehow. Here are some other ideas for slightly larger budgets of things dad might actually get stoked about. You know the dad in your life better than I do, but here are some new dad toys that I’ve seen recently that are sure to get attention. I hope someone in the family is reading this since some of these items are also on my list for Father’s Day. I want me a La Sorrentina espresso maker with frother! My Nespresso will do in a pinch but I can never get the milk right in their Aerocino milk heater-upper. This “faithful remake” (says the WSJ) makes a great espresso and has a mid-century jet design you have to love. Designed by Girodano Robbiati in the late ‘40s, it’s a simple stove-top espresso machine that looks beautiful. I can’t afford the $2K for the Astra machine I really want but would like a way to avoid my many trips to the coffee store even if that is a nice way to take a break. For those of us who can’t afford an Oculus Rift, here might be something to give us a little taste, as reviewed in a fun article in the WSJ. 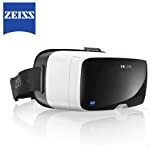 The Zeiss VR1 basically holds your iPhone so that you can see a double screen and get the stereoscopic effect of a virtual reality viewer. Because this one is by Zeiss, apparently the optics are better (and it has a head strap!) than cheaper models starting at $25. NB: right now tray only fits iPhone 6 and Samsung Galaxy. This is one of a new set of affordable musical instruments that are changing the way that both adults and kids play music. Why lug a huge guitar when all you need are the strings and some source of amplification. Purists will complain that there is no acoustic feel, but for some the trade-offs will be worth it, including more portability and more time with the instrument. This guitar-like device uses infrared sensors on the fretboard to to see where you are placing your fingers. The jamstik is super small device weighing maybe 2 pounds. It comes with a shoulder strap for ease of playing since you can’t cradle it in your arms like a regular guitar. Included is a downloadable app for iOS that both teaches you how to use the Jamstik, but also how to play the guitar. It’s also Garageband compatible if you’re already proficient at the guitar. Note that without a big amp, or headphones, the twang of the strings, which aren’t tuned like a real guitar, can overwhelm an iPad’s speakers making listening to yourself difficult. The Jamstik still makes a fair amount of noise so don’t count on playing it in bed while your wife is sleeping. 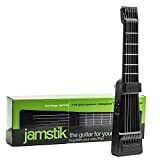 I’m a novice guitar player so I’m unable to tell whether learning to play guitar on the Jamstik would translate into picking up a real guitar and playing it in the same way. The jamstik can be seen in action at http://youtu.be/NCFv6k-CdWE. We’ve been long a fan of the original iGrill, which has helped me monitor many a steak and roast over the past five years. The iGrill is a thermometer you stick in a roasting piece of meat which then monitors the temp while you’re in the other room via Bluetooth on you phone. This is particularly valuable when you’re doing a roast and recipe book times are merely a suggestion and no real guide. Real man grillmeisters will say they use the finger method to check doneness of a ribeye or NY, but I’m afraid I never have achieved this level of knowledge of meat symbiology. That’s where the iGrill has helped for both 6 lb roasts and the ordinary steak or pork chops you don’t want overcook. Cooking guidelines on the included app alerts help you keep track even while you’re having prepping in the kitchen or having a glass of wine with friends (while showing off your tech). The original iGrill was the launch product of the iDevices team and it did suffer from a few beta problems. In design, it was a big clunky box that often needed to be reset to work properly. While the temperature light on the box had a frustrating auto-shut-off, the Bluetooth transmitter stayed active until you fully shut off the monitoring, depleting many sets of 4 AA batteries. However, it did make up for this with the convenience factor and dual monitor probe functionality. The iGrill mini solves the battery issue in a far smaller form factor with a red or blue light that indicates when you’ve hit critical temperature. A similar unit costing around $80, incorporates an LED display with the current temperature. Go for that version if you can afford it since it does help avoid the “hunt the phone” game while you’re grilling. Also watch our video review of the iGrill Mini. The PicoPro is an easy to use projector in a very small package. At about the size of one and half decks of cards and weighing only 8oz, this is a very portable device made for travel and can be used for everything from business presentations to movies. While it includes a charging plug, the small unit incorporates a battery strong enough to last 2 to 3+ hours on a single charge depending on whether you’re streaming video through it’s WIFI connection or through a wired connection. Note that it only works wirelessly at this point using Miracast through Android devices, though a wired connection is easy using a either USB or a lightning connector to iPhone or iPad. The picture is bright and sharp owing to 720px HD. I’m told the lamp, actually a laser, should last 10-20,000 hours which is a lot of movies! See our recent video review of the PicoPro. If you’re at all worried that white collar sitting around all day jobs could be the newly identified health hazard of this decade, the Varidesk is for you. It comes in 3 different sizes from 36 to 48 inches and is made to sit on your current desk. Setup is a breeze as you can see in our longer review. In our tests over the past month, we’ve found it to be a very solid product at an affordable price point, just made for people who don’t want to upset their current office setup to gain the health value of a stand up desk. An associated app reminds you when to sit and stand (30 minutes each) and keeps track of the standing calories you’ve burned for extra motivation. At $350, this is a bit pricey for father’s day, but it does show you care about dad’s health. The Bemo is a small video camera that I’d recommend to 12 year old girls and new dads. For new dads because it makes it easy to grab and shoot all those priceless moments that happen with babies and small kids. It’s HD, easy-to-use and makes it simple to share with friends and family. You can read our longer review of the Bemo here. And speaking of sharing pictures of small kids, here’s an ideal gift for the new grandpa (or dad stationed overseas). The Nixplay is a subscription-free picture sharing frame that makes it super-simple to send photos to someone far away so that they display on a motion-activated WIFI-enabled frame. Aside from bright photos and multimedia capabilities, the feature that sets it apart is it’s simplicity of setup. 10. A nice picture frame with a picture of us as a family. Yeah, it’s sappy, but I never understood the fascination with ties as gifts when most people just want to be surrounded by people they love or memories of good times together. Experiences or memories of experiences are the best gift, so also bring on family cooking classes, a family round of golf, a family trip to Italy! It’s all good whenever we’re together and everyone is smiling.